01:01 | The Ministry of Finance (MoF) has held a flower-laying ceremony rehearsal at the Government Complex. The ceremony will be held on October 26 for mourners who cannot attend the royal funeral at Sanam Luang. Meanwhile, Bangkok Governor Police General Aswin Kwanmuang has so far accepted 25,000 sandalwood flowers, 335,000 bottles of water, Bt240,000 (about US$7,255) cash donations from the private sector. So far the city has collected more than 12 million funeral flowers for use during the royal cremation ceremony. 03:33 | Deputy prime minister General Prawit Wongsuwan has chaired a meeting of relevant officers about preparations for royal funeral ceremonies across the country. In the meantime, royal crematorium replicas and funeral flower arches across the country have been completed. 04:49 | Buddhist temples across Thailand have held mass ordinations for males and females in tribute to the late King Bhumibol Adulyadej. 06:09 | The Marine Department has announced a ban on ship activity along sections of the Chao Phraya River near the royal cremation grounds between October 25 – 27, and also during the grand rehearsal on October 21. 07:16 | Leading Thai universities have showcased their studies based on the late King Bhumibol Adulyadej’s teachings. The research forum was joined by Chulalongkorn University, Thammasat University and Kasetsart University, and featured various findings related to the application of the late King’s sufficiency economy philosophy and new theory agriculture. 09:10 | Newsline takes a look at the training being provided to volunteers for the royal funeral service across the nation by Metropolitan Police Bureau (MPB). 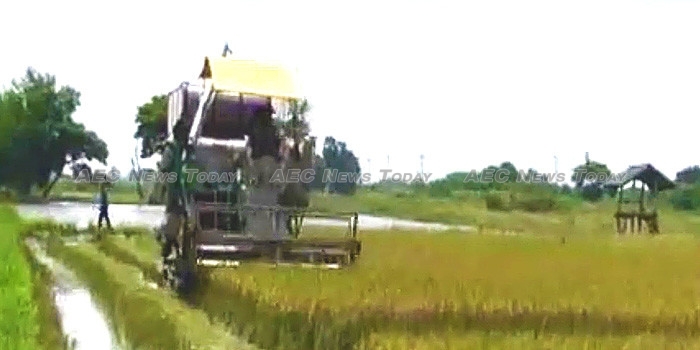 18:52 | The Ministry of Commerce (MoC) and will provide ten combine harvesters for farmers as part of its assistance policy for the 2018-19 planting season, in addition to up to Bt2,000 per farming household to rent rice-harvesting equipment. According to the Rice Exporters Association of Thailand 5,363 farmers who own 18,120 hectares (7,332 acres) of farmland in 12 provinces will benefit from the scheme. Meanwhile, the Department of Internal Trade (DIT), along with the Geo-Informatics and Space Technology Development Agency (GISTDA) has developed a mobile app to manage harvesting machinery rentals. 20:46 | The Ministry of Energy (MoE) will host the 7th Asian Ministerial Energy Roundtable (AMER7) from November 1-3 in Bangkok. The meeting will provide a platform for energy producers and consumers in Asia to discuss present and future demand, in addition to issues affecting oil markets, gas markets, and disruptive technologies.